Smartphone Projector for iPhone Android Tablet Vamvo is currently selling at $99.99, which is its normal price. It has a lowest price of $99.99 and is selling within its usual range. Price volatility is 0.15% (meaning it does not change often), so you might have to wait a while for the price to drop. Until then this is a recommended 'ok deal'. The current deal is also the best price on this item over the last month. 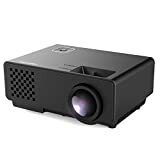 Compare the current price, savings (in dollars & percent) and Buy Ratings for the top Portable Projectors that are closely related to Smartphone Projector for iPhone Android Tablet Vamvo. Here is how Smartphone Projector for iPhone Android Tablet Vamvo compares with other leading Portable Projectors.
? 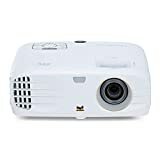 CLEAR IMAGE -- Vamvo YG510 1080P projector, adopted the lasted upgraded LED technology, provides 20% brighter image than ordinary LED projector.
? 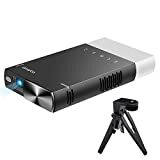 PORTABLE -- The size of Vamvo mini projector YG510 is almost same iPad mini so it is easy to take to enjoy movies, musics or play games anytime and anywhere.
? DURABLE--Vamvo Upgraded LED Projector adopts the latest technology Smarteco Lampcare to make the rate of energy conservation up to 70% and lengthen the life span to 30,000 hours which is 10 times of the traditional ones.
? RAPID HEAT DISSIPATION -- The heat vents are integrated with the speaker mesh on the both sides of the projector body which makes the heat dissipate rapidly. ?Just as cinema, the dark the environment is, the better the performance is. ?It is not recommended to use for PPT or business presentation. FeaturesDuplicate your Smartphone Screen via USB charging/data cable: Instantly turn your tiny phone screen into a large, high resolution projection. 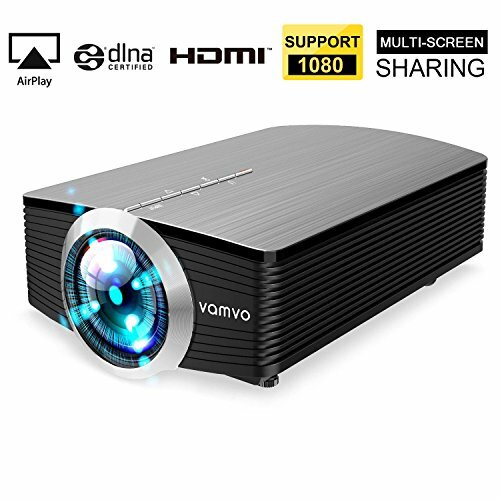 You can totally get rid of the visual fatigue from staring at a small screen for hours.The Ultimate Viewing Experience: The Vamvo Home Theater YG510 projector supports 1080P, a contrast of 1000:1, and has a built-in stereo speaker. The result is a brilliant, vibrant image with remarkable sound effects. Absolutely fantastic for watching a family movie or for playing your favorite video games.Supports multiple media inputs?This Home Theater Projector is compatible with: iPhones, iPads, Android devices, laptops, PCs, MacBook, XBOX, PS3/PS4, DVDs, Headphones, TV, TV boxes, and more! There is no need to buy extra adapters. *Risk-Free Warranty & Local Customer Service?Vamvo provides a 24-month manufacturer warranty for this product. If you're not completely satisfied with your purchase, please let us know via email or phone call, we'll offer a refund or replacement within the first 3 months. This way, our customers are guaranteed a risk-free buying experience.